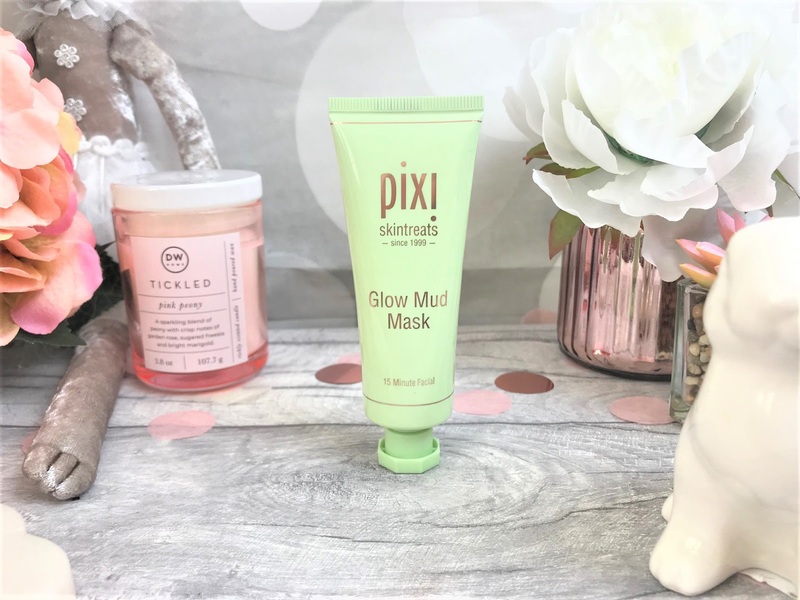 We will start with the Pixi Glow Mud Mask (£18.00) which is their 15 minute facial. This face mask has been formulated using Kaolin Clay to give the skin a deep cleanse and to purify the skin, along with Sea Salt to detoxify the skin and Ginseng to brighten and clarify. The texture is that of a clay mud mask, and it is grey in colour, so it feels like something you would find in a spa. Pixi recommend using this on an evening, by applying a thin, even layer to clean skin (I like to cleanse before I apply a face mask) and then sit back and relax for fifteen minutes before rinsing off thoroughly and patting dry. As well as using this as a face mask, it can also be used as a spot treatment as and when needed, but when using as a face mask, I like to use about 2-3 times a week to get the best results. 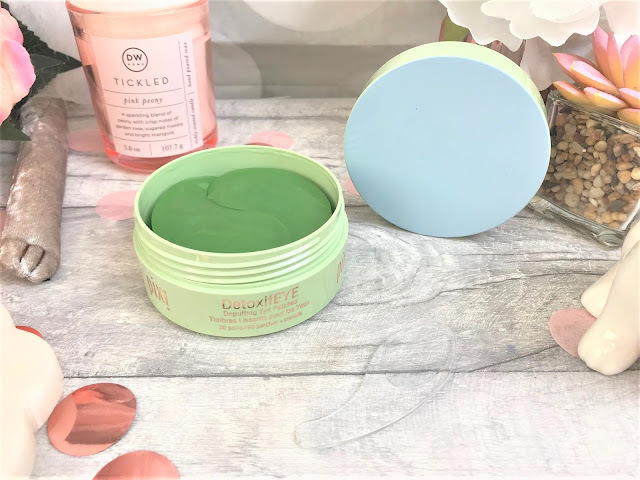 This does have a slight tightening effect when on the skin, but certainly nothing unpleasant and it leaves my skin feeling super clean and refreshed. I have combination to sensitive skin, and I found that this caused me no irritation whatsoever. 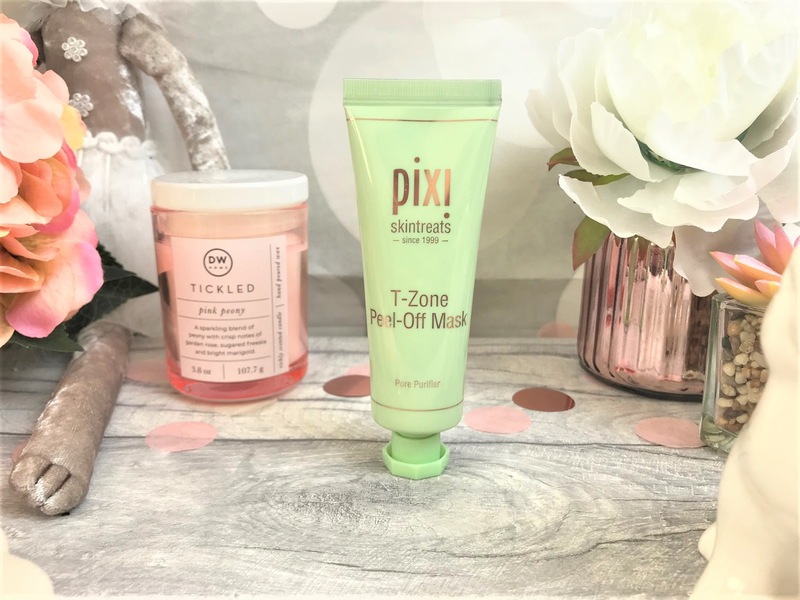 Due to having severe endometriosis, my hormones love to play havoc with my skin and particularly my T-Zone, so I was very intrigued when I saw the Pixi T-Zone Peel-Off Mask (£18.00) in this package. I get very oily along my T-Zone and I have struggled with makeup because of this, however this mask draws out impurities and lifts away oil to give immediate results. I have used this a couple of times now and I have noticed that after use my foundation is staying on a lot longer than it did previously. The formula contains Green Tea to firm the skin as well as act as an antioxidant, Seaweed to renew and condition the skin (great for after harsh weather), and avocado to hydrate and smooth the skin. Pixi recommend using this just 1-2 times a week rather than 2-3 times, which suggests to me the ingredients may be a little more powerful than other masks. I always find a peel-off mask super satisfying and I find that this really cleans out my pores which is something I suffer from and which doesn't help my confidence on no makeup days. Thank you Pixi! 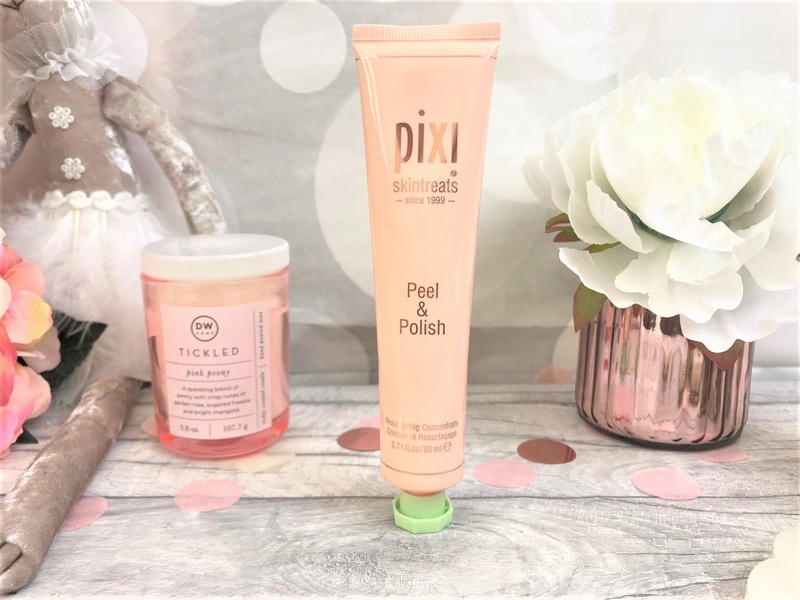 The only product which I have previously tried in this selection is the Pixi Peel & Polish (£26.00) and as I mentioned I love peel-off products. This is like a liquid version of microdermabrasion, as it gently exfoliates and polishes the skin, to leave you with softer and smoother skin with a hint of a genuine healthy glow. If you have a lot of build up, you can use this as an exfoliator by massaging it into the skin, but I personally don't need that level of exfoliation. Ingredients-wise, we have Lactic Acid to exfoliate and clarify, Papaya Fruit Extract to improve the texture of the skin, and Sugar Cane Extract is what gives the skin a natural glow. The Peel & Polish is super quick to add into your skincare routine, and can be used morning or night, two to three times a week. You simply apply for product to dry skin and leave for 2 minutes whilst the enzymes start activating, and then rinse off. Those few minutes are totally worth it as this will really revolutionise your skin. I adore the baby pink packaging too! 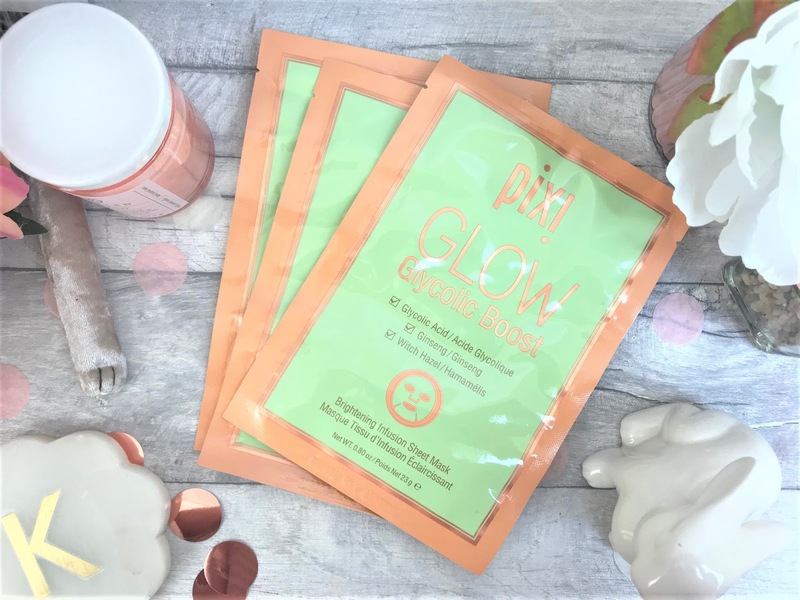 As I mentioned I use the Pixi Glow Tonic every single day, twice a day, and so I knew I would love the more intense Pixi Glow Glycolic Boost Brightening Infusion Sheet Masks (£10.00 for 3). This is such a good price for quality sheet masks, at just £3.33 each, as some can cost way upwards of £10.00 per mask. 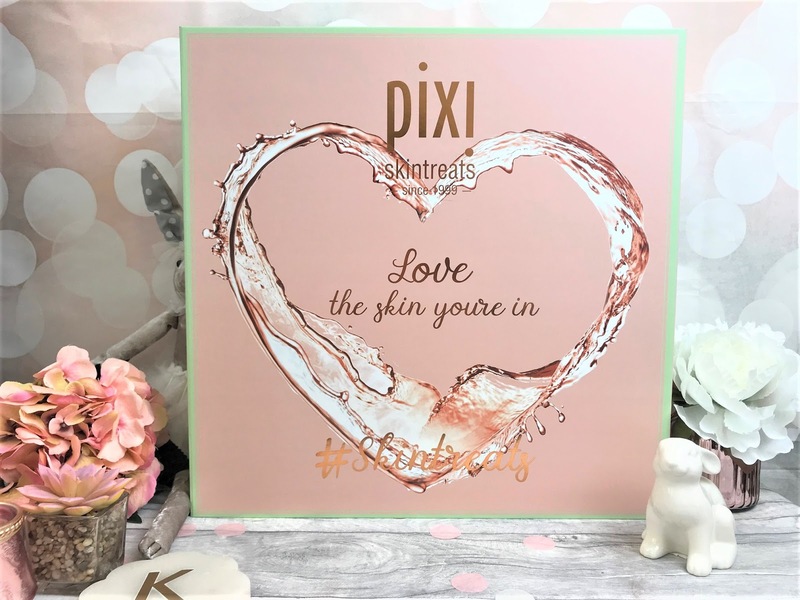 The Pixi Glow sheet masks contain a serum concentrate of glycolic acid to brighten the skin, and herbal extracts to improve and maintain the health of the skin, in turn to give more luminous skin. If I have run out of Glow Tonic in the past, I can tell that I haven't been using it as my glow seems to get duller when using an alternative toner. Sheet masks are so handy to have, you can pop it on in the bath, whilst watching television or reading a book, and I have even taken them on board a flight with me to add some much-needed moisture to the skin. The mask itself has little slits in them so that you can fit it comfortably onto your face and sit back whilst the mask does all the hard work, leaving your skin looking and feeling much healthier. One of the newer products in this kit is the Pixi DetoxifEYE Depuffing Eye Patches (£22.00 for 30 pairs) and I couldn't be more thrilled. 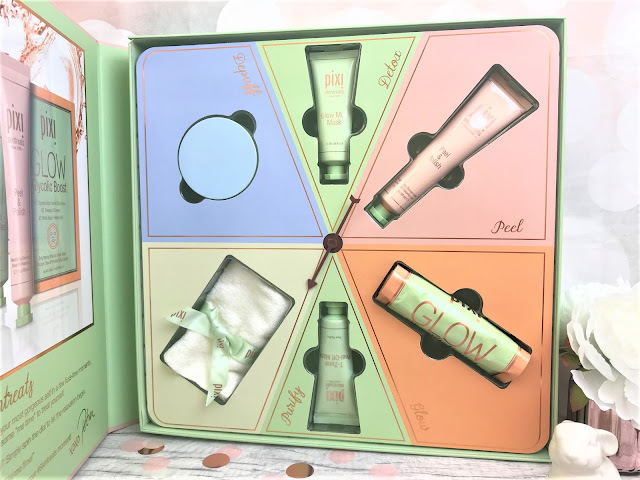 I sleep terribly and I use Liz Earle's Eye Bright every morning to try and wake myself up, and have other products to try and de-puff the area around my eyes as well as to try and get rid of the dark circles, so I was definitely looking forward to trying out these beauties. This pot contains a little spatula to help you remove the patches from the tub, and thirty pairs of the eye patches and as soon as you place one under each eye, it instantly refreshes the skin. The patches have been infused with hyaluronic acid to keep moisture into the area, and caffeine to smooth and de-puff, therefore reducing those pesky dark circles. Due to the amount of hydration you are getting, I have been using these each morning as I tend to have a bath rather than a shower, but you only need to leave them on for ten minutes, so you could do so whilst in the shower or whilst you are getting ready. I think it is great that you get 30 pairs, as this works out at 73p a pair and is going to last you more or less a month. You can find these absolutely wonderful products online at Pixi.